This page is about the American twin-engine fighter P-38E. For other uses, see P-38 (Family). The P-38E Lightning is a rank II American twin-engine fighter with a battle rating of 3.0 (AB/RB) and 3.3 (SB). It was introduced in Update 1.53 "Firestorm". 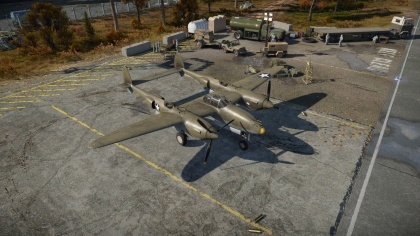 The P-38E is the first of the P-38 vehicles available in game, and is all round a very good plane. It gets an Interceptor airspawn on most maps, which allows the P-38 to very often find itself above or at an equal altitude to it's opponents. 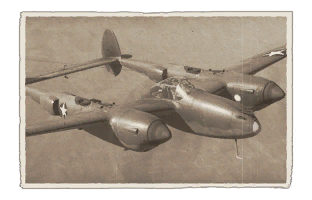 The main strength of the P-38E is it's speed and energy retention, so it should be used accordingly - play it as an energy fighter or Boom 'n' Zoomer. The P-38E is also surprisingly maneuverable for such a large plane - while it can't outmaneuver single-engine fighters, it can put up a good fight. This page was last edited on 6 April 2019, at 17:52.